Pen and brown ink, brown wash, heightened with white gouache, over black chalk, on laid paper. Arthur Kay (1861-1939), Edinburgh (his sale, London, Christie's, 22 March 1929, lot 140, as Giorgione (according to Bologna 1969, p. 109); purchased in Zurich in 1953 by János Scholz (1903-1993), New York (see Lugt Suppl. 2933b). Christie’s, London, 22 March, 1929, lot. 140; Oakland and elsewhere 1957, no. 1. Fortunati and Mumeci 2000, 168, 175. Selected references: Oakland and elsewhere 1957, no. 1 (as Nicolò dell'Abate); Bologna 1969, 108-09, under no. 50 (as not Nicolò dell'Abate). Neumeyer, Alfred, and János Scholz. 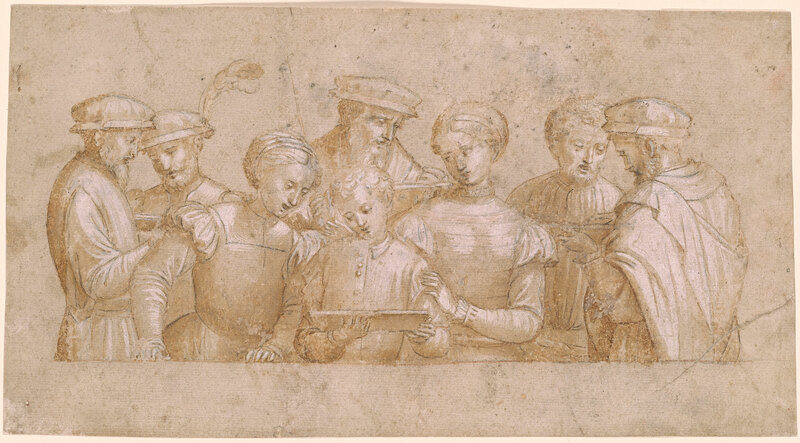 Drawings from Bologna 1520-1800. Oakland : Mills College Art Gallery, 1957, no. 1, repr.